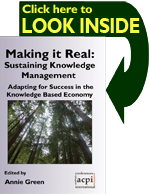 My book “Making it Real” contains stories from Knowledge Management (KM), Intellectual Capital (IC) and Organizational Learning (OL) researchers and practitioners. Their stories provide invaluable insights, practices and lessons learned for future implementations of these new approaches to business management. The researchers and practitioners, or authors within this book, bring a real-world focus that establishes a valuable relationship between KM, IC and OL and other prospective business users. These authors translate their real-world focus into a language that others can understand. 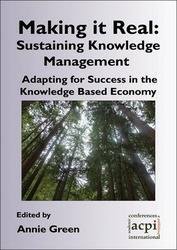 Each chapter is written to contribute to the stickiness of KM, IC and OL. Whereby, each chapter’s message makes a significant impact on other business users about how these new business approaches can help them to improve their organization’s performance. These chapters contribute to the momentum when the use of KM, IC and OL reaches its tipping point, where the critical mass is using KM, IC and OL to work better and faster. So, my book “Making it Real” spotlights the researchers and practitioners who tell their story in a language to guide other KM, IC and OL implementations towards success. Note: Terms (stickiness and tipping point) are based on Malcolm Gladwell’s book: “The Tipping Point: How Little Things Can Make a Big Difference,” (2000, Brown & Company, Boston).